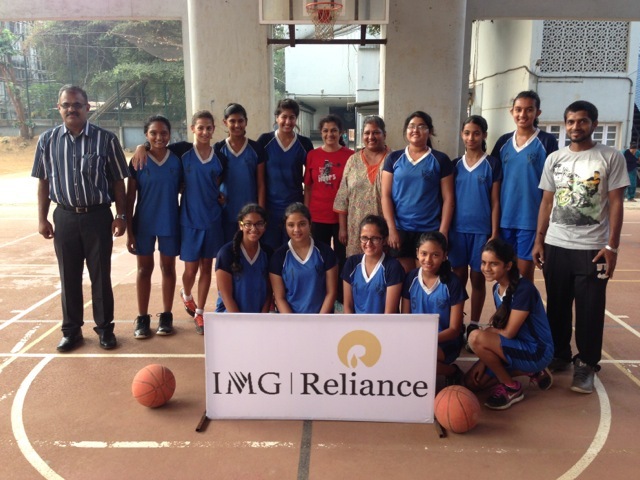 Press Release/20th December, 2013: After a hectic week wrapping up the league stages in the BFI IMG-Reliance School League in Mumbai, the competition headed towards the knock out stages where the 8 teams in boys and girls played against each to vie for a place in the top 3. In QF1, Bombay Scottish girls had an easy outing against IES V N Sule Guruji, whom they beat 29-08. Rachel Netto had 7 points and Esha Parulekar had 8 points for Scottish. Ruttu Pujari and Siddhi S had 4 points each for IES. The second quarterfinal was definitely a treat to watch. Favorites Divine Child was up against Fr. Agnel’s and this game would definitely go as one of the best games of this league. The game was neck and neck throughout and Fr. Agnel’s played the game of their lives. At the half, the score was 26-22 in favor of the Fr. Agnel’s but in the later half, Divine Child fought hard to lead by 3 points with around 27 seconds for the end of the game. Fr. Agnel’s definitely had a different plan and with the ball in their hands they converted a 3 to tie the score with around 12 seconds to go. A time out by Divine Child would have definitely helped them regroup and hold their nerves but a tactical error and a steal by Fr. Agnel’s gave them an apportunity to hit a buzzer beater and win the game. That’s exactly what Fr. Agnel did. A steal and a game winning buzzer beater helped them clinch the quarterfinals and move to the final four. Darshana Deepak had 20 points for Fr. Agnel’s and Shreema Shetty had 15 points for Divine Child. In the boys QF4, D J Doshi Gurukul was up against a formidable Don Bosco High School Matunga. Pool toppers D J Doshi were up against the 4th ranked team in Group A, Don Bosco High School, Matunga. D J Doshi coach would have been happy as his main player Ayum Halwai returned from the Under 17 Nationals tournament to take part in the QF game. But the addition Ayum certainly did not help. Don Bosco supported ably by 6”4’ Suraj and their PG Darshan Gandhi totally outscored their opponents to win the encounter 55-46 and qualify for the final 4. Don Bosco will be meeting Hansraj Morarji Public School in the Semi Finals who beat Shishuvan School 38-20. Suraj had 18 points and Darshan Gandhi had 12 points for Don Bosco. D J Doshi’s Ayum Halwai had 18 points for his team.